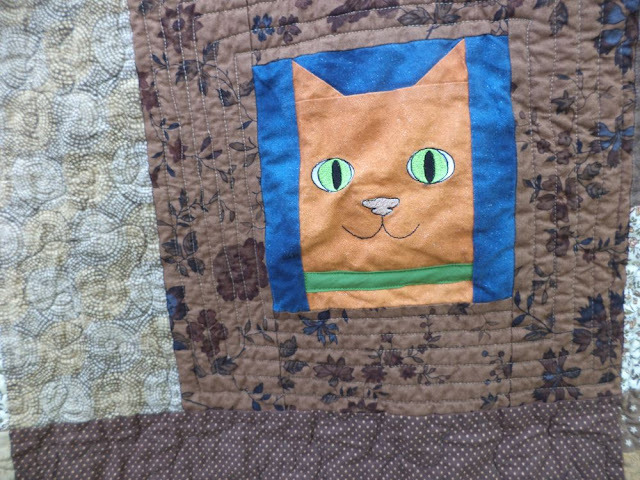 This week's quilt is literally the cat's meow. I scored 11 of these cat blocks during Cynthia's orphan adoption event. They came from the very generous Laurie at ThreeOldKeys. 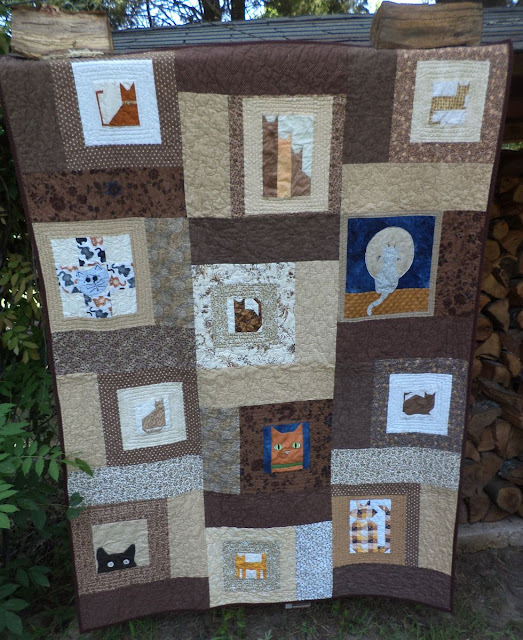 I made a 12th cat block (the peeking cat on the lower left) to finish out the set of cat blocks and built them up into a top with browns from the stash. I sashed all the blocks up to 12.5", then they are set in a "Dancing Nines" type arrangement a la Bonnie Hunter, where the outside sashing alternates sides. The cat blocks I was sent included 6 paper pieced 4" cats, several odd sized larger cats, and a couple of applique cats. 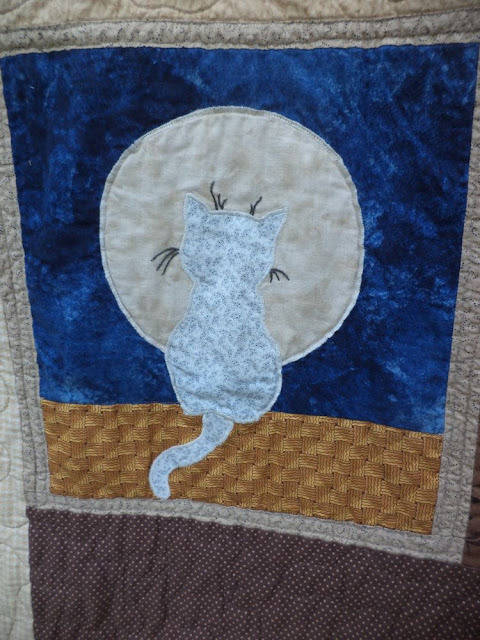 Moon cat is one of my favorites. 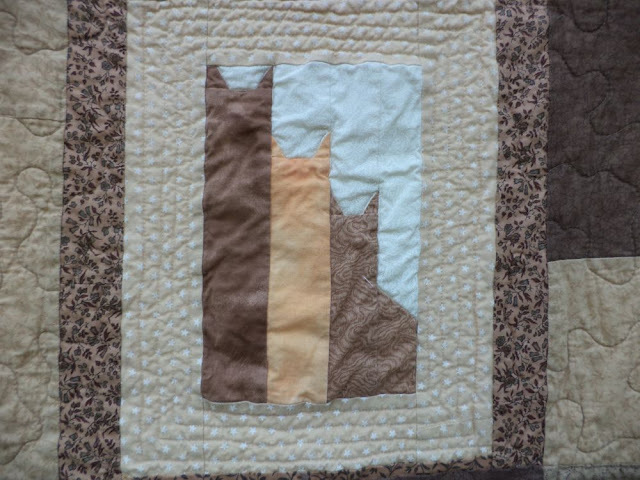 Quilting was pretty simple, just outlined the cat blocks and stippled in the background. There was one exception to the simple FMQ. I did a cat FMQ in this nine patch that needed something a little more (tutorial here at Inbox Jaunt). 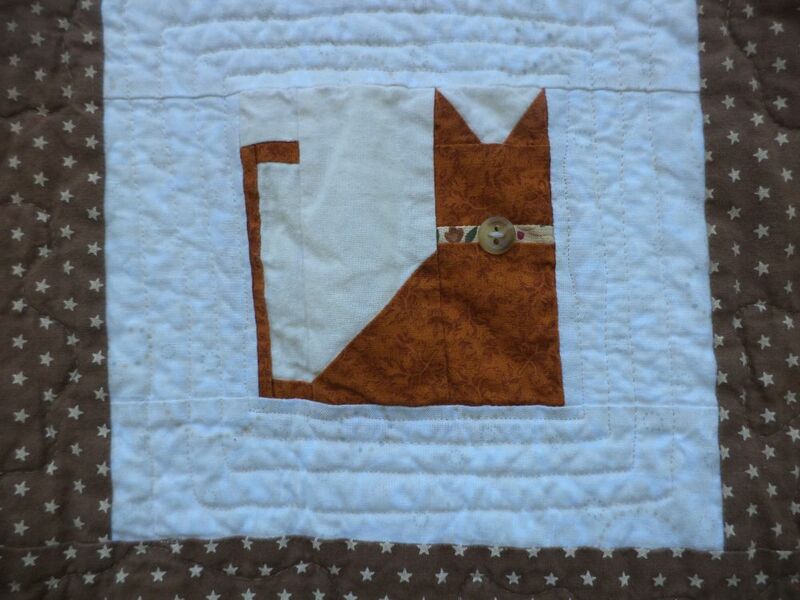 Although a couple of my FMQ cats did end up looking a bit like squirrels. 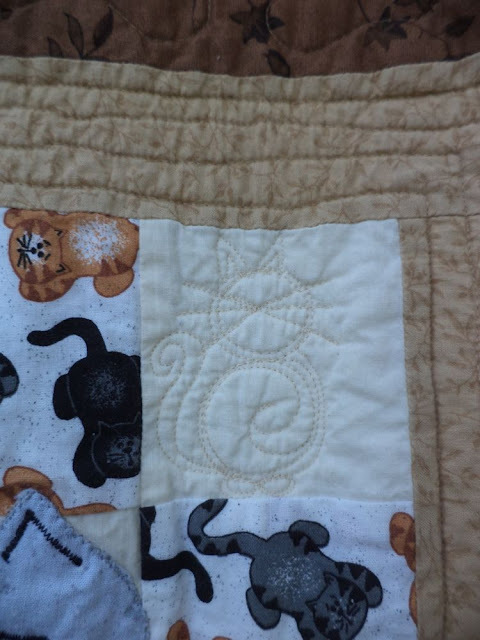 I'm told these blocks were made by the members of a long defunct quilting bee. 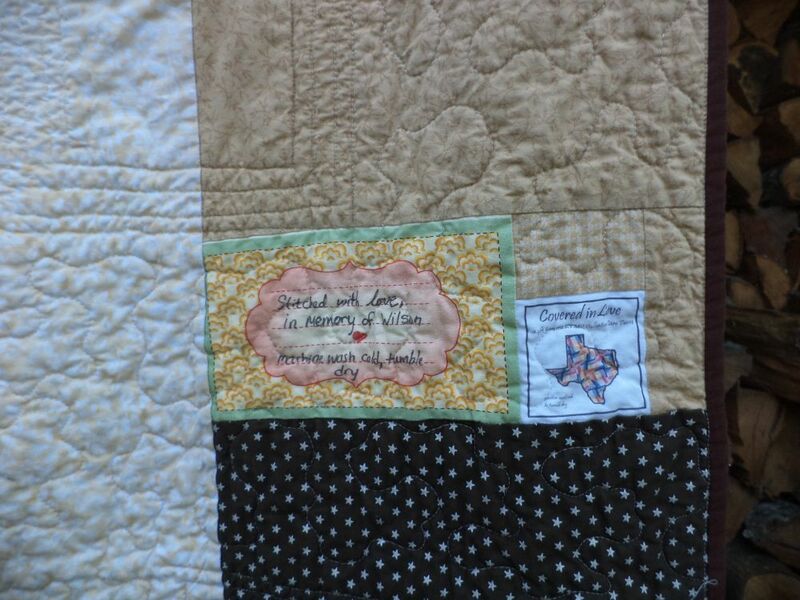 This quilt is bitter sweet for me. Sweet because I obviously love cats, and I love it whenever I can take UFO blocks and finish them out. Plus it's another quilt for Covered in Love. Bitter because, well, Wilson has been missing since the beginning of June. One of the hazards of living in the country is that there are always bigger, hungrier animal lurking in the woods. We actually lost Elvis, too. I've been too sad to mention it on here until now. It's been over a month and I still keep looking for him, wondering what he's doing, and wanting to go to the door and call him. I always assumed he'd die of a pneumonia one winter, and that we probably wouldn't have too many more years together with his compromised lungs, but I thought I would have time to say good bye. These boys. I miss them. I'm absolutely not "over it" yet, but I am telling you about it today because this week the next chapter began. Her name is Rorschach, aka Rory, and she's 6 weeks old. Notice the "ink blot" on her forehead. 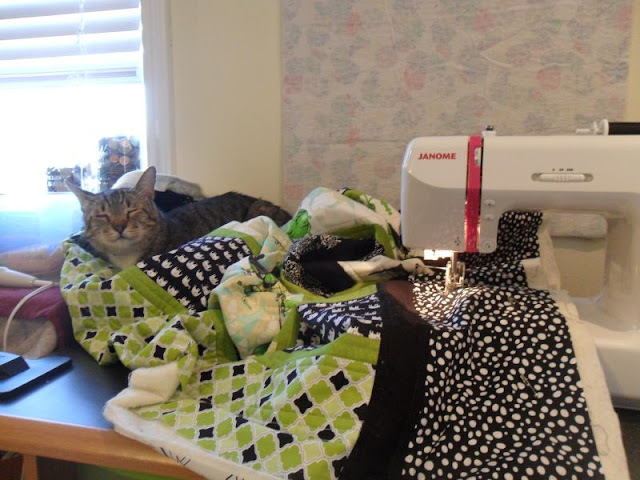 Learning to sleep through the noise of the sewing machine. Oh Kat, that is so sad. Looking at that gorgeous photo it is hard to believe they have gone. Sending you big hugs. I'm so glad we live in a country that my cats are able to wander outside without the threat of predators. 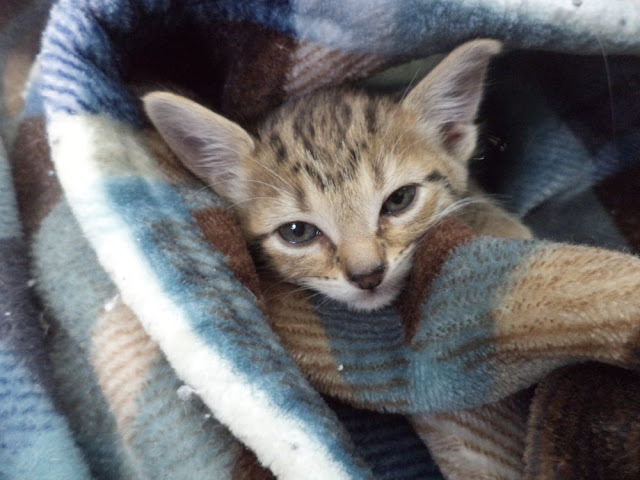 Rory is very cute-will she be an indoor cat? 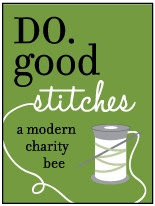 Oh I love what you have done with the orphan blocks-great save. So very sorry to hear about Wilson. That's the worst wayy to lose one, with no closure. Rory looks very special. Those ears! Beautiful quilt, but so sorry to hear about your cats. 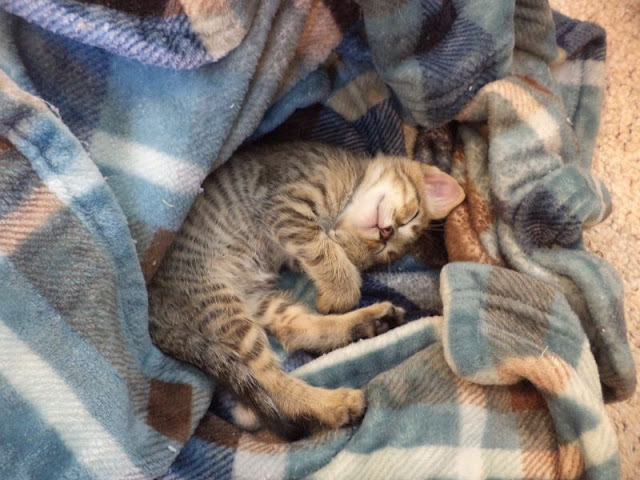 The new kitten is very cute! Bless your loving heart. Rory is lucky to have you. The spirits of your other cats will.let him/her know that. 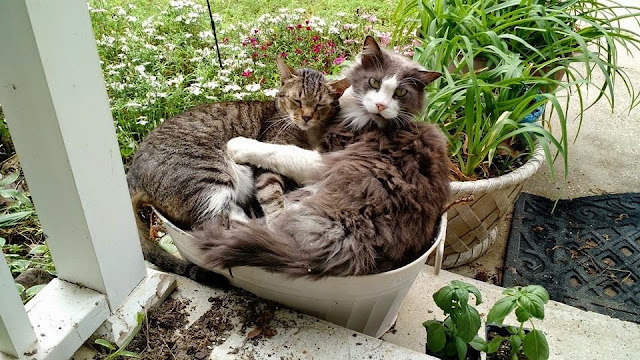 Oh I'm so sorry to hear about your cats. 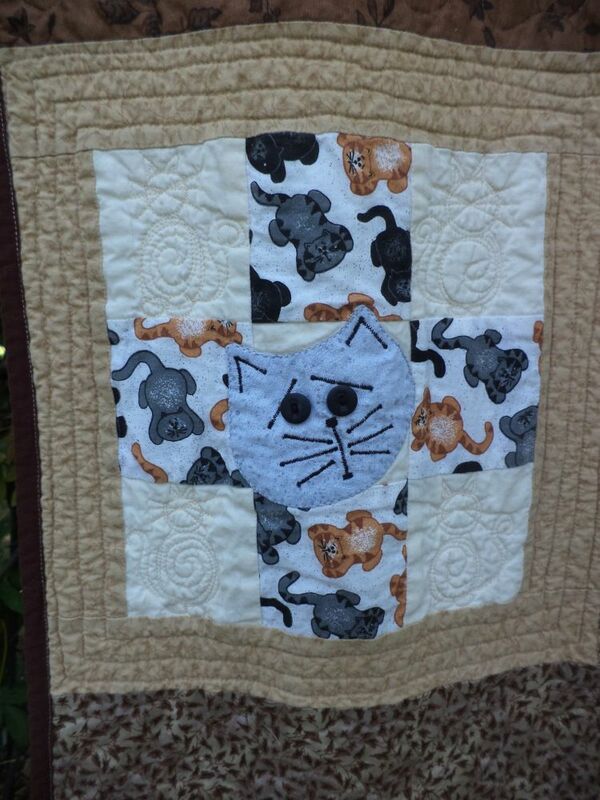 Your orphan cat quilt is lovely and very special to rescue so many blocks and use them for a wonderful purpose! Sorry about your boys Kat.......I had a cat go missing as well......I know the feeling of loss you must be experiencing now. It does get better, and I KNOW that Miss Rory is helping you feel better day by day.